Talk as part of the exhibition „Cacophony of Things"
The starting point of the conversation with Stefan Wagner is a used coffee paper cup. Both items - object and guest - have been chosen by Paweł Kruk. 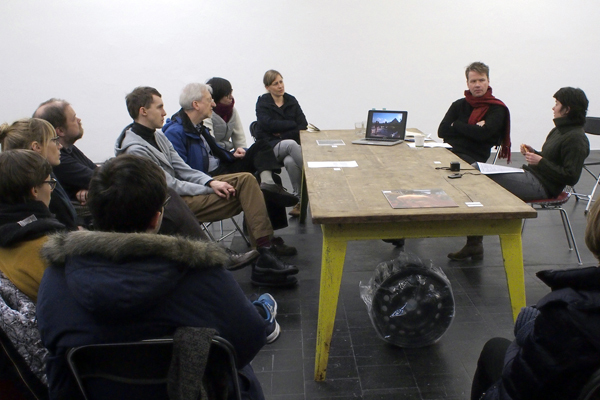 Until 2014, Wagner was part of the curatorial collective "Corner College" in Zurich. He not only curated projects by the artist, but also accompanied him last November for a research project and performance in Cairo. In the performance the artist followed the myth of ghosts of other artists, and traced the death and afterlife of James Lee Byars and Bas Jan Ader. Stefan Wagner will give an insight in Paweł Kruk's oeuvre and will re-enact the artist’s most recent performance based on a telephone interview of Mary Sue Ader in 1976. Paweł Kruk (born 1976 in Koszalin, Poland) lives and works in Bolinas, California.